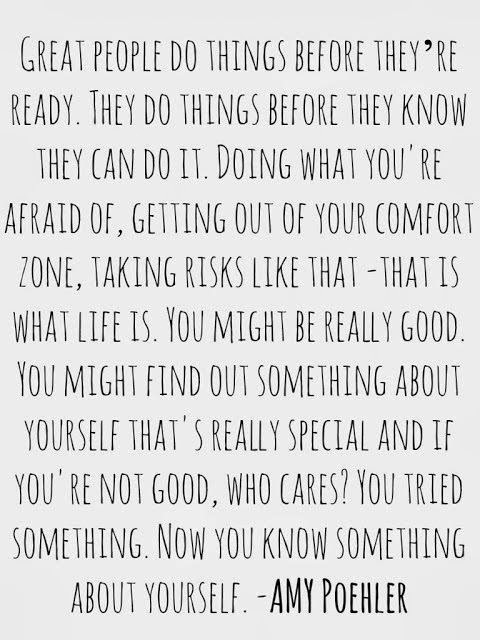 Stepping out of our comfort zones is always kind of a big deal. What if I fail? What if it doesn't work out? What if I'm not happy? Well, what if you love it. What if it does work out. What if you're the happiest you've ever been. All these 'what if's?' aren't worth leaving unanswered. If you spend life thinking 'what if' you'll have very limited experiences and, if you're like me, won't necessarily find those things that make you tick. I felt like I spent too much time thinking 'what if' when I was in my teens - a time when most are out there just going for it and giving life a go, I was a little more reserved. Maybe I'm wrong, because it's not like I stayed at home and sat on the computer all the time...I just feel like it took me longer to really become a 'Yes Woman'. I suppose, the first time I properly stepped out of my comfort zone (aside from my first admin job at 15!) was when I moved out and went to Uni. It wasn't always easy - the first year was as you would expect; minimal work and a lot of drinking and late nights but I suffered quite badly anxiety during my final two years. Despite all of this, being fortunate enough to be very well travelled during my almost twenty three years (at that point), I wanted to see more of the world. This really dragged me out of my comfort but I truly loved every moment of it. It's really crazy how being away from 'real life' and experiencing new cultures, meeting different people and just generally having time to reassess can make you feel. This was a real turning point for me. I took a chance on travelling. I also took a chance on my own strength as person and my ability to deal with whatever life as a backpacker threw at me. While I was away, I met somebody; it moved quickly and before I knew it I was back home after the trip of a lifetime and back in the UK planning to move away from my hometown for somebody I hardly knew in the real world. Naturally, this all fell through but it, again, was the break up was the best decision I could have made. Rather than fighting through every day and just 'putting up with it', I was pretty cut throat about the whole situation. Even now, I'm surprised by how I was and how I just didn't let it phase me. I still to this day feel like, even though it was my decision, I should have been more upset. Was this me toughening up as a person? Another real turning point for me after a step back and usually being a person to just wait it out and allow myself to not be in control of my own happiness. I guess what I'm trying to say is - we shouldn't live our lives playing it safe. We have to take chances, do something a bit risky, keep ourselves feeling alive. Obviously nobody would choose to learn the hard way but our mistakes aren't mistakes, just experiences. We have to learn somehow. We have to know what makes us tick, what doesn't, who and what are worth spending our time on. If we reach the point of not being content about something, we move along and take on the next idea, no matter how big or small. There's no book of life to determine what is or isn't worth taking a chance on. The reason behind this post? Something has happened with me recently that was completely unexpected after such a short amount of time. I can't really divulge too much at the moment as it's early days with some figuring out to do but it's EXCITING! I suppose, it's also what I really wanted for myself - to prove myself, to really make something of myself and to have all of the experiences that are now on offer to me. I've been back and forth in my head about whether it's the right decision; what if I screw it up? What if it doesn't make me happy? what if I should just plod along where I am and not chance it? - I've thrown the what if's away. They've gone. I said in 2013 I would become a Yes Woman. I said in 2014 I would step it up a notch. For 2015 I said I would keep living by that mentality, and that's what I am doing. Right here, right now, I'm taking this chance I'm being offered - that chance for good things, positive things and I am tackling it head on. The truth of the matter is - nobody knows what the hell we're doing. We're all winging life. And we will never know what we are capable of unless we try. Not just a little bit, I mean really really try. If we wait until we're ready, we'll be waiting all our lives. There's never a right time, you never know what's around the corner. So next time you're met with something that leaves you thinking 'what if', take that bull by the horns, do your thing and show everybody what you're made of. But most importantly, show yourself. You're made of way more than you think.